Huawei’s name means “Chinese achievement,” and the tech giant’s global success is evident at its headquarters in Shenzhen. The Shenzhen campus produces 240,000 of Huawei’s smartphones every day. It also has massive exhibition halls that showcase the company’s vision for the future – smart homes, smart cities and robotic replacements for the conventional workforce. “The West now suffers from being a welfare society – there’s an issue of strikes. In the future, you use robots. They don’t strike. 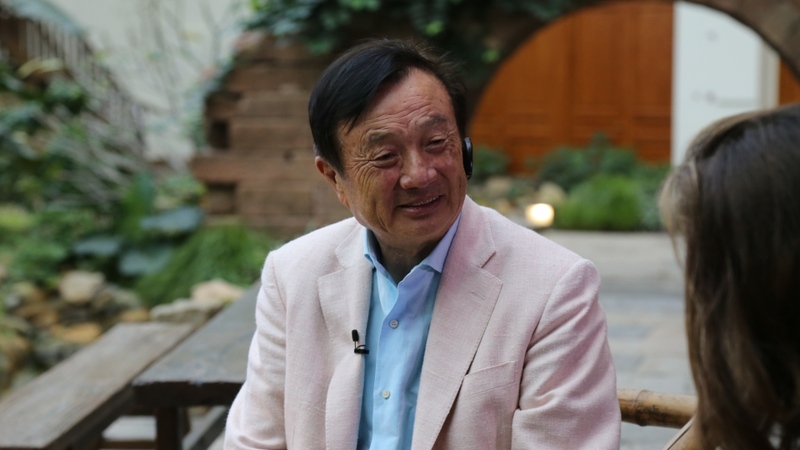 All they need is batteries,” Huawei’s founder and CEO Ren Zhengfei told CTV News Chief Anchor and Senior Editor Lisa LaFlamme in a rare, two-hour interview. Huawei is in the global race to shape the technological future, and the first change on the horizon is the development of a 5G, or “fifth generation,” telecom network. But Ren downplayed the importance of 5G, which will enable much faster internet connections. “It's just some gear, 5G is not that important. They are exaggerating. Now everyone knows 5G,” Ren told LaFlamme. “In the past nobody knew what G we were talking about." The U.S. has labelled Huawei technology a security risk in 5G discussions with other countries, but the company vehemently denies that its software and hardware are tied to Chinese spying. Huawei is suing the U.S. government over a law that would limit the company’s sales of telecom equipment in America. Ren told LaFlamme that he would never risk alienating his customers around the world by providing a back door to information for the Chinese government. He also said he “firmly” supports U.S. tech and social media giants, such as Facebook, Twitter and Google, entering China. Despite the controversies surrounding the company, Huawei continues to highlight its achievements and profits. The company employs 180,000 people globally, and 60,000 of them work at the Shenzhen headquarters. A newly-built Huawei research and development complex in Dongguan, north of Shenzhen, replicates 12 European cities -- including Paris and Verona – and has its own tram system. The headquarters in Shenzhen are spread over two square kilometres and dotted with buildings designed for work, rest and play, as well as perfectly manicured lawns and gardens. Employees have access to sports facilities, pools and a space to practice yoga or meditation. Workers who live in one of the subsidized apartments on campus don’t even have to leave the tech hub. Even lunch runs like a high-efficiency production line. Employees’ backpacks are checked on the way to the main cafeteria, which bustles with activity every day at noon. There’s even a man-made lake on campus, where black swans hold court. It’s been widely reported that the swans were brought in to represent “non-complacency” within a corporate culture and remind employees that disaster could come at any moment. But Ren said those stories are fake. In fact, he said he doesn’t even like the black swans.